The election results were clear: the wave that mattered was a bipartisan, pro-public education wave. So now that the 2018 midterm elections are over, it’s time to get down to the business of supporting and improving our Texas public schools. We at Raise Your Hand Texas are encouraged by the significant number of new legislators who made it clear on the campaign trail that their top priority is ensuring all 5.4 million Texas students have what they need to be successful in school and beyond. First, the Texas Legislature must address school finance in a meaningful way. Texans like to tout that everything is bigger in Texas. Unfortunately, that isn’t currently the case with investments in our schools. Over the past decade, funding has remained flat, saving the state billions of dollars. In the next biennium alone, the state expects to “save” an estimated $3.5 billion dollars due to local property tax value growth. That savings should be reinvested into public education — not used to plug holes in the state’s budget. Sadly, Texas ranks 43rd in the United States in per-student funding. People around the state have told us that’s not OK. They know a lack of state support cripples local school districts’ ability to effectively address increased cost pressures, leaving little room for schools to pay teachers better, to ensure lower class sizes, and to improve programs. Our teachers and students deserve better and the state should increase its financial commitment to a level all Texans can be proud of. Public dollars should stay in our public schools. 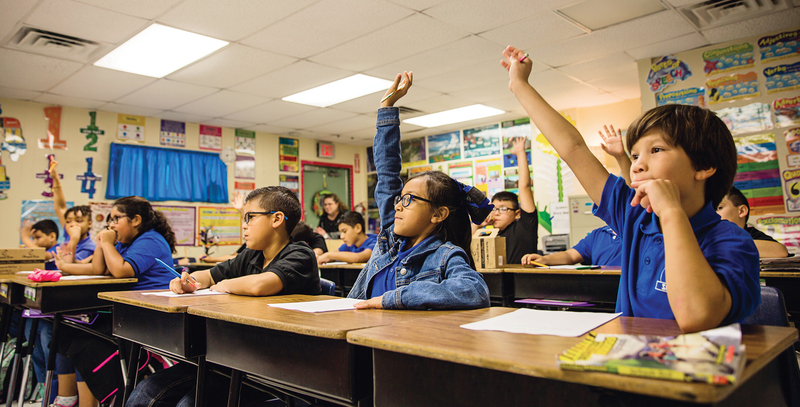 People are encouraged by local public school districts expanding choice and opportunity, whether in the form of specialized campuses or new courses, but one thing is clear — Texans want legislators to say “no” to vouchers in any form. Vouchers are taxpayer-funded government subsidies for private schools and vendors with no accountability for results. They reduce fair access to educational opportunity, weaken rights for students with disabilities and expose taxpayers to fraud. 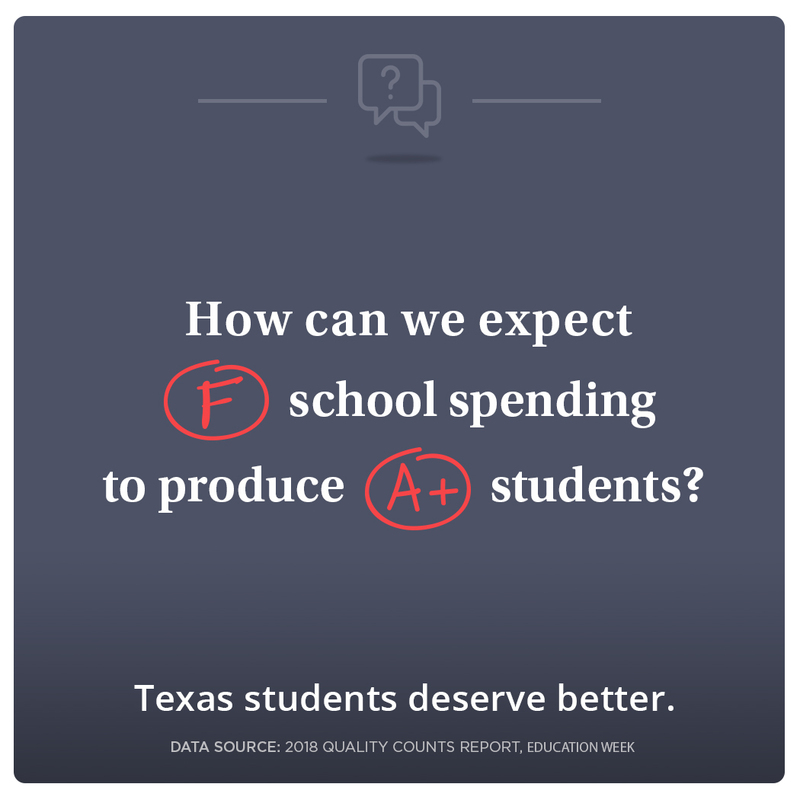 Instead, the state should strengthen investments in public schools, the only system with the capacity to educate the large and diverse student population of Texas and transparency for how dollars are spent and what is taught. We must invest in our youngest learners through full-day pre-K. Fifty-nine percent of Texas students are now considered economically disadvantaged and many of them are not ready to learn when they enter kindergarten. To build a strong future, we must invest in a strong foundation. For eligible students, a half-day in the classroom is simply not enough. Decades of research concludes that high-quality, full-day pre-K has a measurable, positive impact on kindergarten readiness. The Texas Legislature should commit to specific long-term pre-K funding. 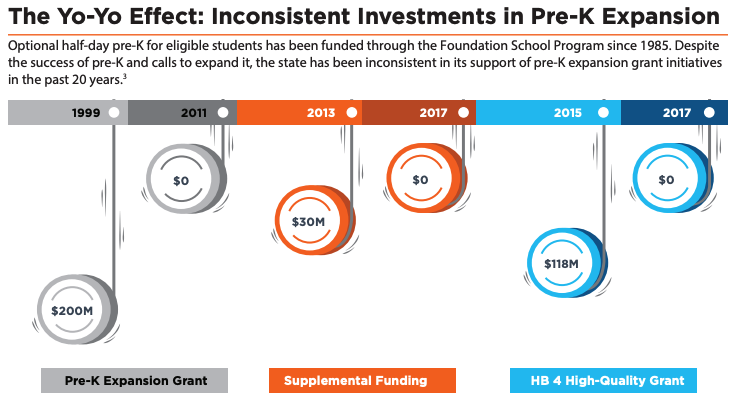 In the past, the state-funded numerous pre-K expansion grants, but that funding went from inconsistent to nonexistent. As a result, school districts are not committing to pre-K at the level necessary for statewide impact because they have no assurances that funding for full-day pre-K will be available in the future. Now is the time for the state to fund pre-K the right way. Despite the many challenges presented to our schools, students are achieving higher results nationally in reading and math than in prior decades. Parent satisfaction with local schools remains high. As recently pointed out by Gov. Greg Abbott, Texas graduation rates stand at an all-time high of 89 percent. Additionally, Texas school districts are introducing innovative programs, options and graduation paths to ensure more students leave high school both college- and career-ready. But there’s more work to be done. By 2020, more than 60 percent of jobs in Texas will require some college education. Currently, fewer than 30 percent of high schoolers complete a college education within six years of their graduation dates. That’s 200,000 Texas high schoolers who don’t obtain a college education within six years of graduation, and that needs to change. Texas must do more. The future of Texas — our economy, communities and citizenry — depends on how well we prepare our students today. To achieve the results Texans expect, we must invest in our students, encourage innovation, and improve college and workforce readiness. We must act now — because the future of Texas is in our public schools. 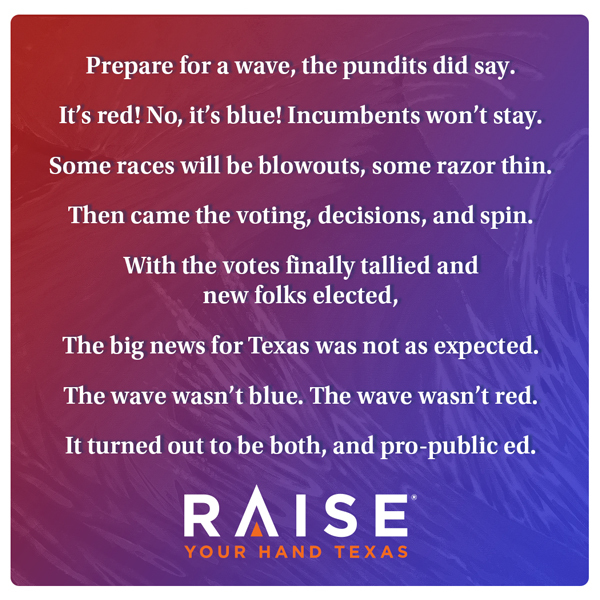 You can find more information about our 2019 legislative agenda by visiting RaiseYourHandTexas.org/Advocacy. Join us as we advocate for Texas public school students.